Even people with little interest in birds will stop in their tracks at the sight of a hawk soaring overhead or a falcon perched on a window ledge. Birds of prey have an aura that few other creatures have. In the acclaimed Hawks in Flight, Pete Dunne showed what birds of prey look like. In The Wind Masters, he shows what it is like to be a bird of prey. He takes us inside the lives and minds of all thirty-four species of diurnal raptors found in North America -- hawks, falcons, eagles, vultures, the osprey, and the harrier -- and shows us how each bird sees the world, hunts its prey, finds and courts its mate, rears its young, grows up, grows old, and dies. 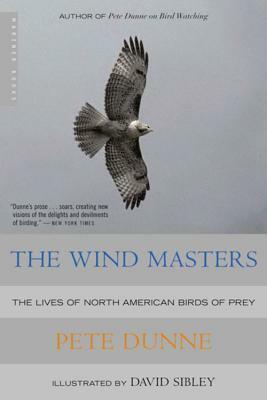 Vividly written, and beautifully illustrated by David Sibley, The Wind Masters is a brilliant work of narrative natural history in the tradition of Peter Matthiessen's The Wind Birds and Barry Lopez's Of Wolves and Men. PETE DUNNE forged a bond with nature as a child and has been studying hawks for more than forty years. He has written fifteen books and countless magazine and newspaper columns. He was the founding director of the Cape May Bird Observatory and now serves as New Jersey Audubon’s Birding Ambassador. He lives in Mauricetown, New Jersey. David Sibley is the author of The Sibley Guide to Birds and several other books.